A boiled potato is a nutritious and low-fat food that can have a place in healthy diet plan. A plain boiled potato provides you with a healthy dose of potassium, fiber and vitamin C, but is also low in calories. Certain toppings can decrease the nutritional value and increase the fat and calorie content significantly. There are ways to flavor boiled potatoes, however, that won't derail your weight loss goals. Sprinkle your favorite dried herbs and spices on your potato. A shake of salt and black pepper is a simple way to add flavor to your boiled potato. Add chili powder for a spicier flavor or rosemary and sage for a more savory taste. Add fresh herbs to your boiled potato. Chop fresh parsley or sage and sprinkle over your potato. Fresh basil, dill and thyme will also add a boost of flavor to a plain boiled potato. Top your boiled potato with a variety of ingredients. Spoon on fresh tomato salsa and low-fat cheddar cheese for a spicy flavor. Low-fat Greek yogurt with chives will create a milder taste. Add steamed fresh vegetables, such as broccoli, as another nutritious way to add flavor to your boiled potato. Make your boiled potato into a flavorful side dish. Mash with skim milk and low-fat plain yogurt for a healthier version of mashed potatoes. Puree with cooked cauliflower and sage for a different taste. Cube your potato and combine with low-fat chicken broth, cooked carrots and cooked celery for a nutritious soup. Make a nutritious potato salad. Combine cubed boiled potato with chopped red onion, celery and dill pickles. Add low-fat plain yogurt, salt and pepper for flavor, and stir to mix well. 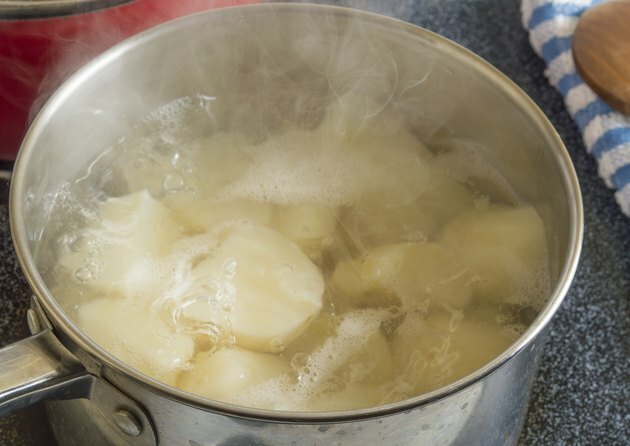 Infuse a boiled potato with extra flavor by boiling it in low-sodium chicken, beef or vegetable broth instead of water. Add spices or fresh herbs, such as salt, pepper, garlic powder, parsley or dill, to the cooking water or broth as another way to add a bit of extra flavor while the potato boils. Boil your potato just until it is soft. If you cook the potato for too long, it will get mushy.